Hesiod: Theogony; Works and Days. Hesiod with C.S. Morrissey, trans. Vancouver: Talonbooks, 2012. Speaking of the need to read an author in his original language, Eric Voegelin once observed that “a good number of persons who are employed by our colleges . . . talk about Plato and Aristotle, or Thomas and Augustine, or Dante and Cervantes, or Rabelais or Goethe, without being able to read a line of the authors on whom they pontificate” (Autobiographical Reflections, in The Collected Works of Eric Voegelin, Vol. 34, pp. 67). Voegelin reminds us of a simple fact: translations necessarily permit only mediated encounters with an author. A translation is, in essence, as much a work of art as the text on which the translator labors. Consequently, one must take care not to lose sight of the translator’s artistic hand in rendering the work accessible to audiences unfamiliar with the author’s original language. In C.S. Morrissey’s new translation of Hesiod’s Theogony and Works and Days, the translator exercises considerable influence over Hesiod’s words. Yet one senses that this is just as the translator intended, i.e. that we are invited to interpret Morrissey as much as Hesiod. As such, the translation is not recommended for scholars seeking a more literal translation of Hesiod’s words. Those looking to enjoy Hesiod’s poetic gifts and to gain a sense of what ancient audiences may have experienced as they heard the poet deliver his finely crafted words will, however, find much to appreciate about this translation. Featuring a foreword by Roger Scruton and an afterword excerpted from Voegelin’s Order and History, Morrissey’s translation of these two seminal works in Hesiod’s corpus grew out of conversations with students in his “Introduction to Classical Mythology” course. Excited by the fresh insights he discovered once he started working through his own translations of the ancient Greek, Morrissey decided to craft a translation that would “present Hesiod’s poetry as engaging storytelling, unmediated by distracting footnotes and scholarly nitpicking” (xv). Accordingly, in place of cumbersome footnotes, one finds brief explanatory information included directly in the translation that Hesiod’s audience would likely have known, particularly regarding Greek mythology. Where Morrissey departs from existing translations, he gives no indications or justifications, so as to amplify “the ease and pleasure” of the reader (xv). Other notable features of the translation include Morrissey’s own chapter divisions, titles, and subheadings, the use of italics to indicate the appearance of a significant divinity or individual’s name, and the translation of thumos as “competitive spirit,” a choice that allows the reader to see more clearly the prevalence of this theme throughout what some interpreters regard as two fundamentally disparate works. Furthermore, in select places throughout the translation, Morrissey uses anachronistic words such as “laxatives” and “toilet paper” on the grounds that “on extraordinary and important occasions a translator simply must translate what he thinks the poet means and not what he says” (xvi-xvii). Again, Morrissey aims to convey the inspired nature of Hesiod’s poetry by adding a modern lyrical sensibility to the storytelling, thereby providing a more joyful and wondrous reading experience. There is much to praise about Morrissey’s translation. His translation of the Theogony in particular captures many of the hauntingly beautiful images familiar to readers of the original. One almost feels present at the Battle of the Titans, so crisp and vibrant are the words Morrissey uses to translate this scene. Likewise, one can see, hear, and feel the battle between Zeus and the monster Typhoeus. In Works and Days, Morrissey succeeds in capturing Hesiod’s exhortative tone towards his brother Perses, while at the same time bringing to life in the reader’s imagination the experiences of a simple man living in ancient times. For those with knowledge of ancient Greek, the parenthetical inclusion of the Greek at various points throughout the translation provides a welcomed link with the original language. If anything, one might have wished for more inclusions of the Greek–especially to mark instances of the word thumos–though admittedly this might have undermined Morrissey’s mission to provide a more pleasurable reading experience. As is, the translation is rarely ugly or unwieldy, and the chapter divisions, titles, and sub-headings lend both works a poetic quality that is at once helpful and illuminating. With Morrissey’s translation, one can simply enjoy Hesiod’s poetry. Though at times the reader might miss the added insights of footnotes, the bare presentation of the text allows for a more liberating reading experience. Read aloud, the translation even offers a potentially more authentic encounter with Hesiod’s poetic voice. For the experience itself, scholars ought to read this translation as a supplement to a more literal translation. Simply put, this translation possesses the potential to stir the divine spirit flowing within oneself–praise few translations merit. The modern, lyrical beauty of Morrissey’s translation comes, however, at the expense of other qualities one might seek. Namely, despite Morrissey’s claim to have remained rooted in the original Greek and preserved the integrity of the line breaks in the original manuscript, it must be noted that he exercises considerable liberties with the text. First of all, the last hundred lines or so of the Theogony have been cut, without any acknowledgement. One wonders what kind of story Morrissey is trying to tell by ending with Zeus’ swallowing of the goddess Metis so that she could not give birth to a son who might overthrow him. Moreover, the strange rendering of ἑὴν ἐσκάτθετο νηδὺν as “he invited Metis to flow as one inside” rather than the more traditional translation of “he put her in his own belly” not only makes it more difficult for a first-time reader to understand what is happening, but also suggests Morrissey’s own interpretive lens may be intruding upon the translation. Though some might not appreciate the translator’s lack of fidelity to the original manuscript here and elsewhere, others might excuse the liberties he has taken as they often do help to capture in English the lyrical quality of Hesiod’s verses. This is true as well of the explanatory information that Morrissey includes, and his adoption of modern terminology. While more often than not the additions are fluid and assist the reader’s understanding, at times they threaten to alter the text’s meaning in the minds of unsuspecting readers. For example, in the account of Pandora in Works and Days, Morrissey adds to the mere mention of her name in the original Greek the phrase “the ‘Gift’ for Whom ‘Anything Goes’” and, later, “the ‘Gift’ into Whom ‘Anything Goes’” and “the ‘Gift’ with Whom ‘Anything Goes’” (lines 80, 82, 94). In cases like this, where Morrissey’s additions seem less like harmless bits of information designed to help readers enter the mindset of Hesiod’s ancient audience, and more like glimpses into Morrissey’s own mindset, one worries about unaware readers mistaking Morrissey’s words for Hesiod’s. Similarly, the adoption of modern words and idioms into the translation sometimes transforms the meaning of an important phrase. For instance, in Works and Days, Hesiod rebukes his brother for taking more than his share of their inheritance, and disparages the judges his brother bribed for not knowing that the half is greater than the whole (πλέον ἥμισυ παντὸς), an expression Morrissey translates as “One plus one is two!” (line 39). While this phrase may be more common in modern speech, it could imply the idea of a self-evident truth rather than–as the context suggests–the notion that sometimes less is more. 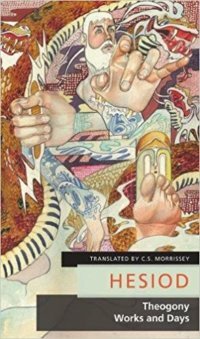 In spite of these criticisms, Morrissey’s translation contributes a welcome representation of two of Hesiod’s central works in a poetic style that modern readers will find appealing. Moreover, the afterword containing an excerpt from Voegelin’s chapter on Hesiod in Volume II of Order and History introduces readers to an important vision of Hesiod’s poetry. A word from Morrissey on why he finds this essay meaningful and how it might have guided his efforts as a translator would have been welcomed. This is especially true given that Voegelin augments his analysis of Hesiod’s poetic truth in the much later, posthumously published Volume V of Order and History. In particular, in this later essay, Voegelin speaks with greater precision of the poet’s role; Hesiod is not simply battling the disorder surrounding him, but seeking to differentiate the tension we all experience between the divine and its material presence. As the earlier essay is worthy of inclusion in itself, Morrissey should not be faulted for not including or referencing the later essay. Those familiar with Voegelin’s works might, however, find their curiosity aroused by Morrissey’s decision to include this excerpt rather than, or in addition to, one from the essay in Volume V.
With any translation, the translator faces a trade-off between accuracy and readability. Morrissey demonstrates that the willingness to sacrifice strict adherence to the text can bring the benefit of a more lyrically pleasing translation. In the case of Hesiod’s spiritually rich poetry, this is a worthy aim that Morrissey carries off with considerable success. Rebecca LeMoine is an Assistant Professor in the Department of Political Science at Florida Atlantic University. She is currently working on her book, Plato’s Caves: The Liberating Sting of Cultural Diversity.